Golf is a luxury and elite sport; it has not penetrated much into the country and also the city. However, we are slowly getting to see new avenues getting developed to learn, nurture and enjoy this sport. There are a handful of golf course in Mumbai city with some even offering you a chance to just pay and play on the go for a couple of hours. A quick search on google for ‘golf course in mumbai’ would list this club located in chembur right at the top of the search results. It is not so without reason as this BPGC has been the top choice for decades in the city. You can get corporate membership(10 years) over here as life memberships are closed. It was built in 1933 by the then Governor of Bombay, Lord Willingdon. This club is located in the heart of the city opposite the race course and close to Haji Ali circle. Apart from the 18 hole golf course, the club boasts of 6 tennis courts, squash and badminton facilities and a health club. The skyscrappers in the background makes up for a delightful view. The USC club, established in 1928 in Colaba is a par 71 and is located along a 1 km long promenade parallel to the Arabian Sea with breathtaking views. Surprisingly, it does not feature water at all except for one. It is mainly a defense services officers club with a few civilian members. Besides Golf, the club offers sports like Swimming, Tennis, Badminton, Squash, Billiards and Cards. USC is one of the top golfing destinations in south mumbai. This one, though situated in the outskirts of the city in Navi Mumbai, it is only the second course in the country offering Pay and Play scheme for any one(no other golf course in mumbai offer this kind of scheme). It opened recently in 2012 and is drawing nice attention from the public for its affordability. You can also very well play on a driving range with 50-100 ball for 300 INR and come to the course when ready. As of now, Kharghar Valley Golf Course is the only golf course in Navi Mumbai region. Apart from the 4 golf courses listed above, golf in mumbai can be played at other golf clubs also. A complete list of them is compiled with their location in the map below. Complete List of Golf Courses with location and Address. 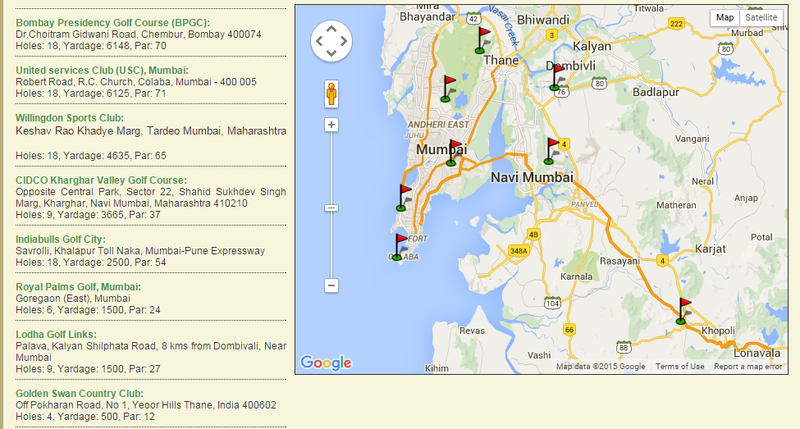 For those who want to know the number of major golf courses in mumbai, the above map just makes the job easier. As we can see, we have 8 major golf courses in mumbai.